The spirit of Berlin captured in a Gin. Germany, like many other countries, is home to a flourishing craft Spirit movement, looking to produce artisan handcrafted drinks, while using quality, local ingredients. 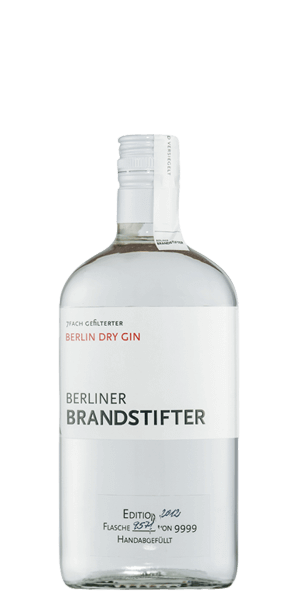 Berlin Brandstifter (literally meaning “Fire-starter”) is the standout representative of the burgeoning scene, committed to the development and production of fine distillates, which truly embody the spirit of Berlin. The company was established in 2009, after Vincent Honrodt decided to make spirits in honour of his great-grandfather, who was quite the master craftsman back in the day. What Vincent lucidly observed at the time was that none of the Spirits available had the same character as those of his grandfather, so he took matters into his own hands and decided to carry on the family tradition. Today the company has three products in their range, all distilled at the Schilkin distillery in Berlin. Through their 7-fold filtration process, the Brandstifter Spirits gain wonderful purity and a very delicate, smooth flavour. Since it is all the rage right now, naturally they are making Gin as well. Germans took their proverbial attention to detail to full effect when making their Berliner Brandstifter Gin. It took them a whole year to perfect the recipe. All the botanicals are handpicked from the Berliner farm Speisegut and carefully combined, everything is local, each bottle is inspected individually. The production is limited to only 9,999 bottles annually due to the small harvest volume. The end product is a unique flavour composition, made up by the 4 key botanicals: elderflower, cucumber, woodruff and mallow. Light and lush, like a refreshing summer morning. Juniper is still there of course, but it has to share centre stage. If you’re open to venturing into new Gin territory and away from the classic London Dry Gin, you’re in for a treat. What does Berliner Brandstifter Gin taste like? The Flavor Spiral™ shows the most common flavors that you'll taste in Berliner Brandstifter Gin and gives you a chance to have a taste of it before actually tasting it.